Breaking up is not just for romantic relationships. When it comes to choosing friends, compassionate, positive and upbeat individuals are the best companions because of their ability to make a positive impact on you. As some friendships develop, however, you may start to notice certain characteristics that cause red flags to fly. Pay attention to your gut feelings, and analyze the effect that the friendship is having on your days, moods and overall well-being when determining whether the relationship is worth maintaining. It is a great talent to know how to forgive and forget, but sometimes feelings of betrayal run too deep to be repaired. Debra J. Slover, founder of the Leadership Garden Fund and Legacy, points out that a friendship is built on trust, and if that trust is broken, it can be very difficult to put the pieces together. Whether your friend shared a secret, lied, stole from you or advanced on your love interest, you must ask yourself if the relationship is worth saving. If the answer is "no," then approach your friend about creating some distance between you. Then, take some time to surround yourself with honest companions. This will help you heal from the hurt, raise your self-confidence and build your trust in people again. Friendships stem from shared interests, feelings of comfort and having fun together. However, it is possible that romantic attraction can develop between one or both parties. The most important thing to remember is to be honest and talk about what is in your heart. If the love is not reciprocated, it is a wise idea to take a step back to nurse your broken heart or to allow him to do the same. This may mean taking a break from your friend for a while, or cutting off the friendship completely so the one with the romantic attraction can let go properly. It is very easy to become friends with someone who has a controlling personality, says UCLA professor of psychiatry Judith Orloff, especially if you are shy or are coming out of a bad relationship. But as your companionship develops, you may soon find that your buddy is beginning to dictate your life. She may say comments that make you uncomfortable regarding how you dress, what you eat or who you hang out with. If you feel that your friend has become domineering and that your friendship is not fun anymore, it may be time to quickly find a way out. Breaking off this type of friendship will not only save your self-esteem, but it also gives you back your freedom of choice and personal identity. It can be very difficult to celebrate the joys of life when you have a pessimistic friend, especially if you like to dream big and have a good time. If you are not careful, being around someone with a constantly defeatist attitude can affect your own mood, thoughts and confidence. Before making the decision to end the friendship, determine if your friend needs professional help, especially if her negativity has developed into a full-blown depression. Urge her to seek treatment, or even contact loved ones to help her find a therapist. 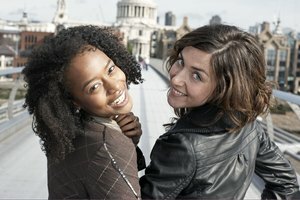 If you find you just aren't meshing well any more, and you don't have the energy or desire to continue working on the friendship, remember that friendships naturally both grow and diminish, and it's okay to gently part ways with her for the sake of your happiness and personal growth. K., Ashley. "Good Reasons to Distance From or End a Friendship." Synonym, https://classroom.synonym.com/good-reasons-distance-end-friendship-16433.html. Accessed 18 April 2019.